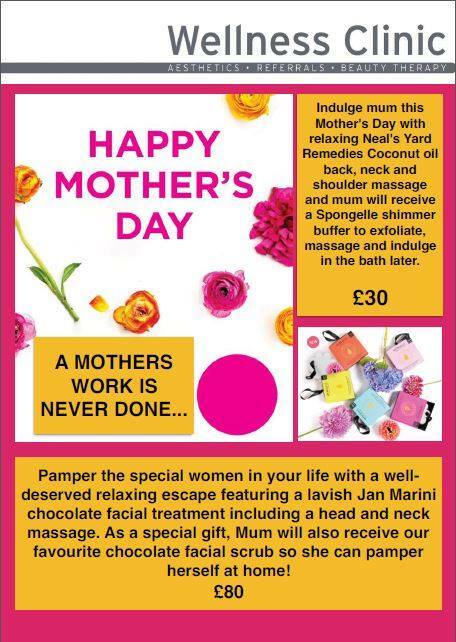 Indulge mum this Mother’s Day with relaxing Neal’s Yard Remedies Coconut oil back, neck and shoulder massage and mum will receive a Spongelle shimmer buffer to exfoliate, massage and indulge in the bath later. Pamper the special women in your life with a well-deserved relaxing escape featuring a lavish Jan Marini chocolate facial treatment including a head and neck massage. As a special gif, Mum will also receive our favourite chocolate facial scrub so she can pamper herself at home! To find out more about all our treatments, contact the Wellness Clinic today and one of our experts can help.